Definition - What does Viparita Karani mean? Viparita karani is a Sanskrit term that denotes an act of inverting. In Sanskrit, viparita means "inverted" or "reversed," and karani means "doing" or "making." Although any inverting action is technically a viparita karani, the term is most commonly used in yoga to indicate an asana known as legs-up-the-wall pose in English. In this asana, the practitioner lays on the back with the legs extended against a wall. Viparita karani is a very restorative and rejuvenating asana that both soothes and energizes the body and mind. 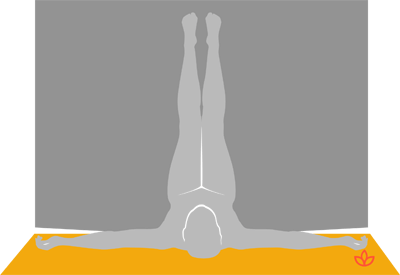 It is an inversion in the shoulder stand family, similar to sarvangasana. However, viparita karani is more accessible for beginners and easier to hold for extended periods of time and, so, the practitioner may enjoy its fullest rejuvenating benefits. Viparita karani is known for a wide range of health and anti-aging benefits. Ancient yoga texts claim that practicing viparita karani hides wrinkles and banishes old age and death. This asana helps cool and soothe the nervous system. The spirit of surrender learned in this restorative posture can be carried into active asana work as well. The higher chakras, like the third eye (ajna) and crown (sahasrara), are stimulated in this pose. Spiritual energy is redirected upward toward these energy centers, preparing the individual's mind for dharana, or concentration. This pose is often done as a final posture before beginning pranayama and dharana. Beginners and those with back discomfort may use a bolster or a pillow as a support for the lower back. It may also be helpful to wrap a strap around the thighs, binding the legs together, so the practitioner can relax more completely in the pose without the legs falling down or tiring out.